I love it when my friend Jim Dixon of Real Good Food goes to New Orleans because he not only posts great photos of the food he finds (and eats), but gives us a taste of the cultural flavors of that special place. Here he shares some of New Orleans' food history along with his version of Cajun gravy. We've been going to Louisiana since one of our kids moved to New Orleans eight years ago, and every time we're there I discover something I want to eat more often. The foodways of the Gulf Coast are simmered in a long history, sometimes dark and mostly forgotten. The contributions of Native Americans, enslaved Africans and displaced Acadians have been stirred together with flavors from the colonial past and perked up with Caribbean spices. In the last century waves of German, Irish, and Italian immigrants added their cooking traditions to the pot, and the food you eat in Louisiana today tastes of all those influences. And while I love the more sophisticated food of New Orleans, I'm drawn to the cooking of the country. It's more like what I cooked before I ever went to Louisiana, simple and ingredient-driven, the everyday food of working people. But there's a lot of crossover from Creole to Cajun, and done right by good cooks the results are delicious no matter what they're called. The first time we drove west from New Orleans toward Acadiana, I asked my friend Pableaux, a prairie Cajun from New Iberia, what I should eat if I really wanted to taste Cajun food. "Anything with gravy," he said. In southwestern Louisiana gravy isn't the pale stuff served on biscuits or the light brown sauce you might have with turkey. 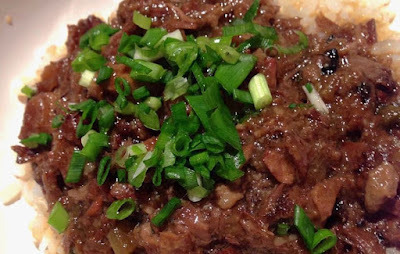 Cajun gravy is meaty and dark; served on rice, another Louisiana staple, it's a meal. On this trip, we went to the Blackpot Festival just outside of Lafayette, a weekend celebration of local music and food that includes an amateur cooking competition. The categories were gumbo, jambalaya, cracklings, and gravy, and everything had to be cooked in a cast iron pot. I watched the cooks, asked a lot of questions, and tasted some good food. When I got back, I had to make some gravy. Beef is used most often for traditional rice and gravy, but squirrels, quail and other game go in the pot, too. Cuts with a lot of connective tissue, often the cheapest, add collagen for a rich, velvety gravy. My favorite at Blackpot combined short ribs and oxtails, but round steak or stew meat work well, too. Start by browning about a pound of meat in extra virgin olive oil over medium heat in a cast iron pot or other heavy pan, turning often until it's well-browned on all sides. Season liberally with salt, black pepper and either a little cayenne or a Cajun spice blend like Slap Ya Mama or Tony Chachere's. Remove the meat from the pot and add a chopped onion. Cook the onion until it's very dark, stirring regularly. More than one cook told me this was critical for good gravy. Add a couple of stalks of chopped celery and some chopped green bell pepper (or a jalapeno). Cook for another 10 minutes or so, then add the meat back into the pot, pour in a couple of cups of water (or stock), cover and simmer for a few hours or until the meat is very tender. If you want a thicker gravy, mix a tablespoon of flour with a little cold water to make a paste, then stir it in and cook for another half hour or so. Serve the gravy over Kokuho Rose brown rice with chopped green onions and some Crystal hot sauce.